We talk a lot about the concepts behind mobile marketing and analytics on our blog. And there’s a real need for that information. 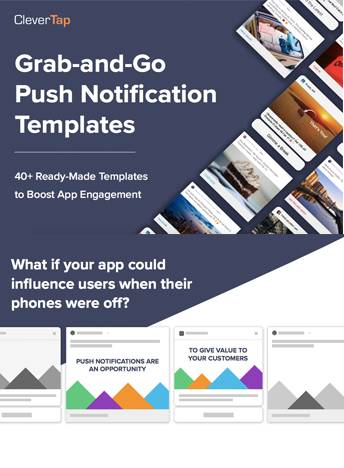 But what about the actual work of crafting your marketing messages to resonate with app users? How does one actually write better copy for push or in-app notifications, remarketing ads, SMS/MMS, and emails? Mobile users are typically up and about, heading off to an appointment, not always sitting down and ready to consume an essay. They’re dealing with a million tiny distractions, alerts, and pings that vie for their attention. They’re seeing your text on a screen that’s tinier than their computers. Below, we present you with some critical principles for mobile copywriting– so you can craft effective copy that resonates with your mobile app users, no matter how distracted they are. There are a million guides for improving your copywriting out on the web. A true craftsperson should head out and look them up. After all, there is always room for improving your trade. But below you’ll find that these best practices we’ve collected are most relevant to mobile app copywriting. Attention: Grab It and Don’t Let Go! Explode right out of the gate and grab users’ attention immediately. This is done by a compelling headline on a banner ad or push notification. Or by the email subject line. Or by the first few characters of an SMS/MMS. The point is to get users to keep reading until they get to the call-to-action. To make them stick around a few more seconds. This is easier said than done because users receive dozens of messages a day and by default will choose to ignore them. Unless you can give them something that tickles their fancy, piques their curiosity, or immediately screams out to them. A word of warning here. Stay clear of clickbait headlines. Those catchy headlines work, yes. But if you fall into the trap of amazing headline but poor content immediately following it (the curse of all clickbait articles), you run the very real danger of destroying the user experience, losing the user’s trust in your brand, and bringing down the brand reputation you’ve been working so hard to elevate. Use specific, odd numbers: Never round, even numbers. Engagement is always better with numbers like 17 or 22311. Numbers in headlines get 327% more clicks than other types of headlines01. Instill FOMO: Technically, “fear of missing out” belongs up there with using emotions. But it’s such a potent tool for mobile copywriting that it deserves its own entry. FOMO is what powers campaigns with limited-time discounts, or “Act Now” calls-to-action, or one-time deals for new users. It uses marketing psychology to prompt (or pressure) users to quickly convert, click, or buy. Brevity: Quick! What’s Your Point? There’s no space on mobile screens for essays. And people have no attention spans either. This means you have zero time to waste. Forget long-winded sales messages or kilometric emails. Keep it short and simple. Otherwise, you’ve already lost them to your competitor’s remarketing ad on Facebook. And just to give you an idea how short you should be, we put together an infographic outlining the recommended length of messages for each marketing channel. To be effective, you need to keep it short so users understand your gist and can decide immediately if this is something valuable or actionable. Tell them what the point is so they don’t swipe away. A note about push notification character limits: Apple and Google limit the number of bytes you can push to your users (payload size). Apple limits you to 2,048 bytes. Google limits you to 4,096 bytes. Technically, this means you could send out 2,048 or 4,096 characters of ASCII text. However, depending on the model of your phone, only a specific number of characters will be displayed in the notification. On Android, you get approximately 11-12 lines of text, or 450-650 characters depending on width of phone. On iOS, you get 4 lines, or about 170 characters. Context: What’s in It for Them? The cardinal rule in all marketing copywriting is to use text to answer the customer’s primary question “What’s in it for me?” That means writing your push or in-app notifications so you focus on the user’s context. The name of the game is relevance to the user. If it’s not relevant to them, it’s spam. What benefit will they get? : They don’t want to read about what your company did or didn’t do. They want to make their own lives better. So don’t talk about new app features, instead talk about how their dating life will become a hotbed of activity, how their work processes will be 20x more efficient, or how their movie time will be much more dynamic. Don’t talk about your company or brand: Don’t just talk about a new batch of products, tell users how hot they’ll look in those cute shoes that just arrived. And by the way, they’re 20% off for new users. Don’t be jargon-filled or acronym-happy: Unless your users use jargon or acronyms on a daily basis. YMMV! It’s your job as a copywriter to craft powerful text that pulls users in at the start (see: Attention) and then persuades them to take action. All text leads to the call-to-action. And if it doesn’t flow toward the conversion step, you’ve failed! In mobile marketing copy, the call-to-action (CTA) is typically at the end. Visually, it should stand out and be impossible to miss. But even more than the look and feel, that CTA button or link should be transparent to users. As in: they need to know where they’re going, or what they’re getting when they click – or else they won’t click at all. Trust is of paramount importance here. Write text that inspires trust. Like any type of marketing writing, mobile copywriting is effective when it’s focused on getting readers to act. But unlike other channels like sales letters or landing pages, your text must be as short as possible, without losing impact. You have to walk a fine line between “too short” and “too generic.” But that’s the beauty of it: monitor the metrics and see whether your copy works, then use that formula till it stops working.